Most people have different kind of fillings in their mouths. Nowadays fillings can be natural looking, as well as doing the job they're meant to do. Most people don't want silver fillings that show when they laugh or smile. What are silver and white fillings made of? 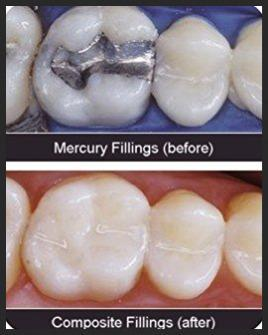 Silver fillings (amalgam fillings) are made of a mixture of silver, tin, zinc, copper, and mercury. They are strong fillings used in back teeth and they are the least expensive type of fillings. White fillings (composite fillings) are mainly made of fine glass particles, synthetic resin and setting ingredient which make them set with the special light. Because many white fillings are classified as a 'cosmetic' treatment, you can only have them done privately. Costs usually depend on the size and type of white filling used. Your dentist will give you an idea of the cost before you agree to treatment. Are white fillings as strong as silver fillings? Nowadays a new techniques and advanced materials are proving that white fillings are almost as good as silver. How long a white filling lasts is dependant on a place in your mouth and how hard you bite. Your dentists will decide which type of filling would be best for you.